Verizon launching BlackBerry Curve 2 | BlackBerry Blast! With all the hoopla going on about Verizon carrying Android phones we almost forgot that they carry BlackBerrys too. 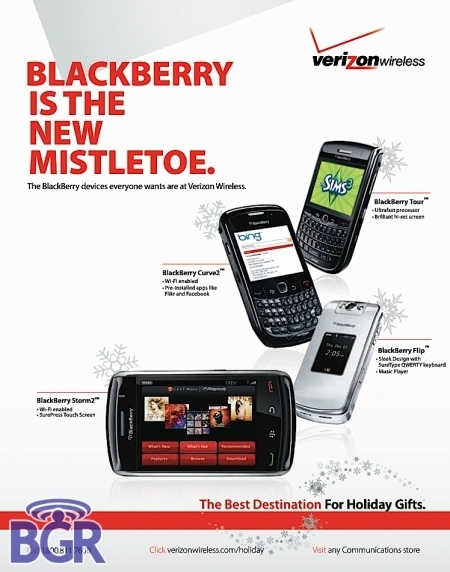 BGR got its hands on Verizon's BlackBerry holiday flyer and it looks like Verizon is branding the BlackBerry Curve 8530 as the Curve 2. The Curve 2 adds WiFi to the popular BlackBerry. Verizon is also offering the Tour, Flip, and Storm 2, but this is the first we've heard of the BlackBerry Curve 2. No release date for the Curve 2 has been announced.